A thrilling close encounter with Patagonian nature and marine wildlife. 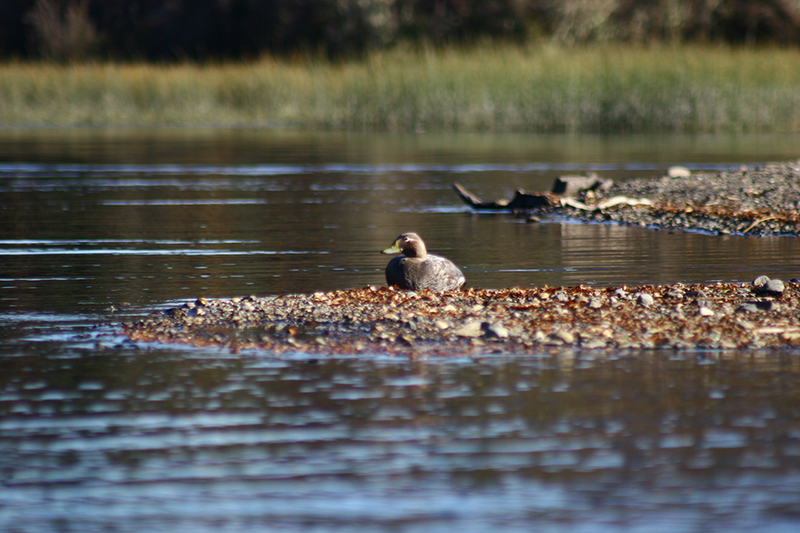 Península Valdés is a natural reserve in the Patagonia, located on the Atlantic coastline. It is renowned for the marine fauna that inhabits its beaches and surrounding waters, such as whales, penguins and many other seabird species, sea lions and elephant seals. Few places offer the possibility to observe so many animals in their natural habitat; this is a true and unique wildlife reservoir in the world and a UNESCO World Heritage site. For the chance to appreciate the abundant local fauna, we recommend our featured product “Peninsula Valdés Adventure”, tour that stands out from others because of the variety and quality of experiences included. The first adventure of the day takes us to Estancia San Lorenzo, a pioneer sheep ranch located on the coastline of the San Matias gulf and 160 km away from Puerto Madryn. 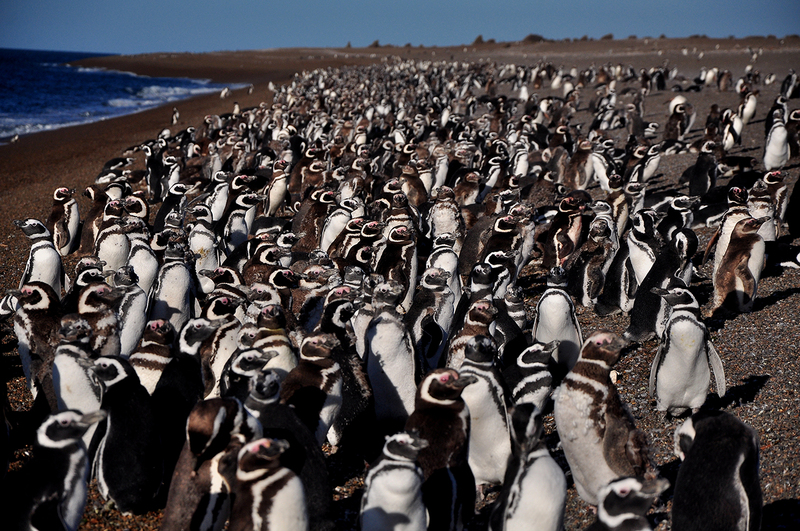 This working ranch not only produces Australian merino sheep wool but it is also the home of a 600.000 Magellanic penguin colony, which brings us to this spot. On a 4×4 Overland truck we will reach the reserve and then trek towards the rookery, guided by naturalist guides. This may be the closest you will ever be of a penguin. Without altering their habitat, we will pass by and observe them. 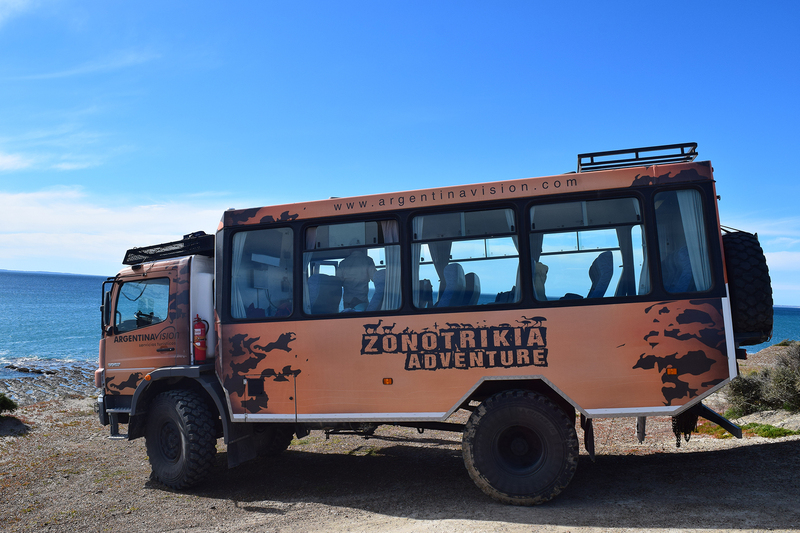 Then, we will hop back on the 4×4 truck and go through the Cañadón de Fósiles, a fossil canyon witness of a million year history. 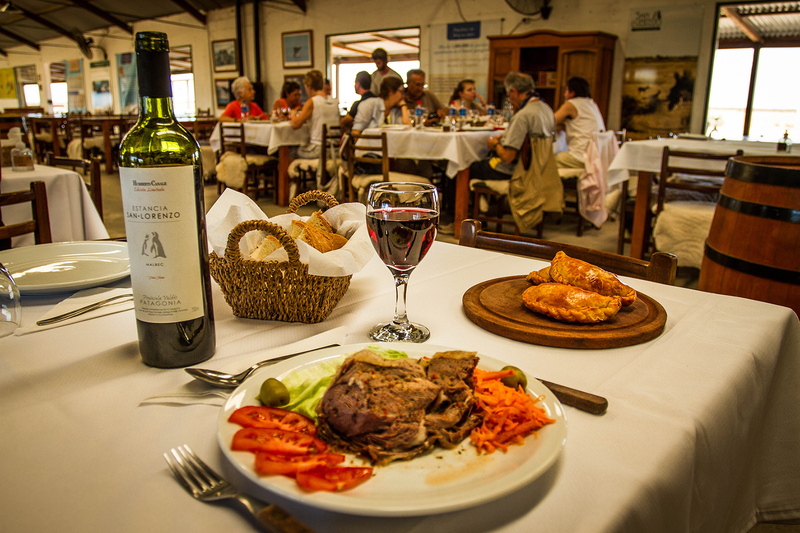 After the active part of the tour, we will get back to the estancia and enjoy an exquisite lamb on the spit in the old shearing barn, which was reconditioned to serve as a country restaurant, visitor centre and mini shop for local products and ranch souvenirs. 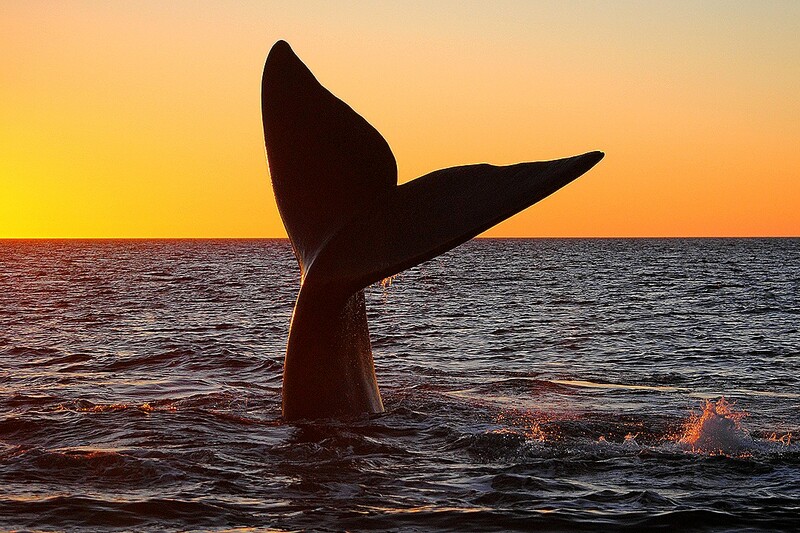 To finish the day, a 2 hour boat ride at sunset in Puerto Pirámides to watch Southern Right whales jumping and swimming around for the best pictures you could ever take. If we´re lucky, maybe these huge and majestic cetaceans will just pass us by so close to almost reach them. As close a you can be of wildlife itself. 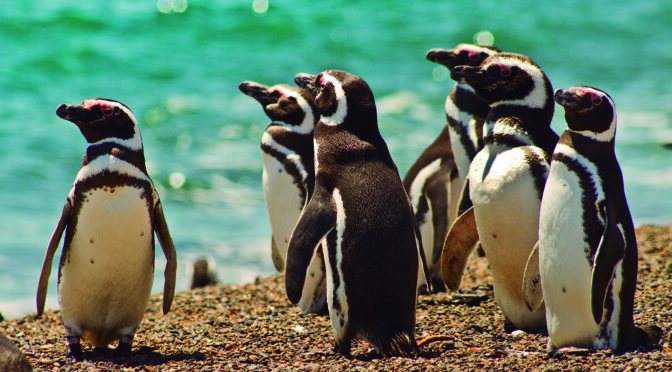 For nature lovers, discover Patagonian marine fauna and fossil history as in no other place in Argentina. Operates from September 15th to November 30th on Tuesdays, Thursdays, Saturdays and Sundays. Full day tour, 12 hs. From 7:30-8 am to 8 pm. Book in advance; only 20 paxes allowed per day. Basic service includes only 4×4 ride. With additional cost: Access to Peninsula Valdés, visit to San Lorenzo and penguin rookery, lunch at San Lorenzo without beverages, whale watching boat ride. 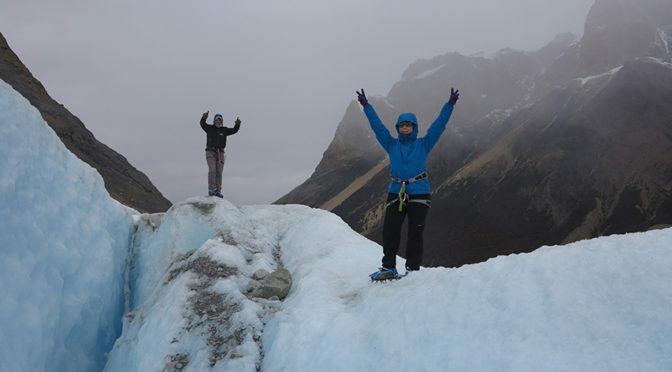 We invite you to have a glimpse of a brand new glacial adventure in El Calafate. 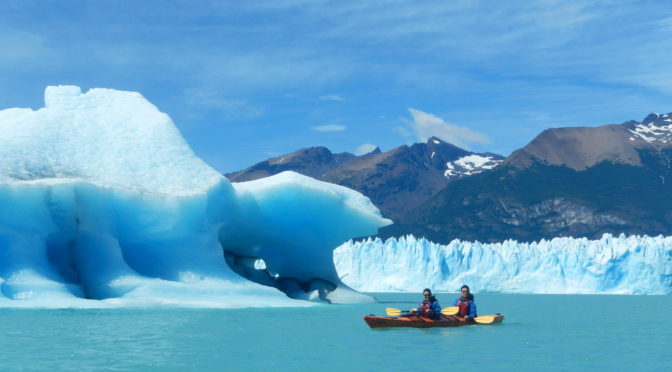 Paddling a kayak, get as close as you can get to the striking Perito Moreno Glacier. 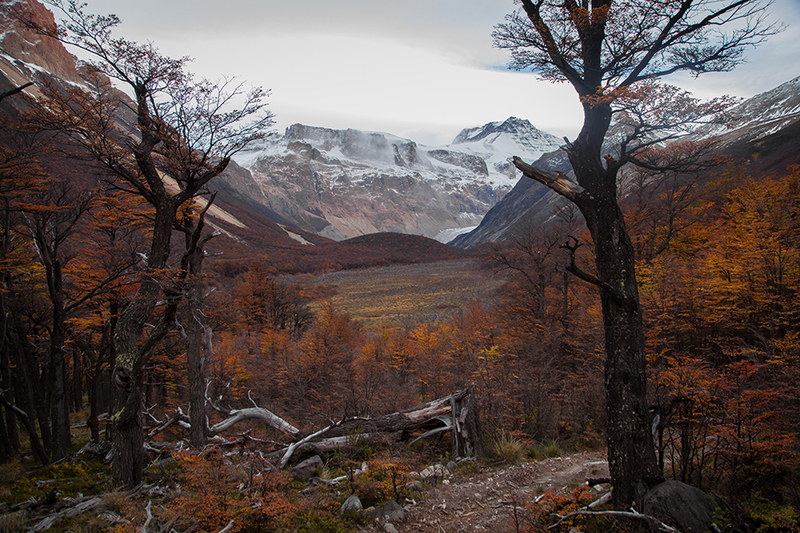 It’s well known that UNESCO remarks the outstanding universal value of Los Glaciares National Park, including it on the World Heritage list to protect it. On its own words, “an area of exceptional natural beauty”. We couldn’t agree more. Milky grey glacial lakes, imposing mountains, glaciers and icebergs in many hues of blue frame this unique and breathtaking environment, where the cracking of ice is everything you’ll hear. The most astonishing sight is – of course – the world famous Perito Moreno Glacier, which calves into the icy waters of the Lake Argentino. Both of these natural attractions are the protagonists of this new kayaking experience, recently launched. After picking you up from your hotel in El Calafate, we’ll arrive to the National Park around 10 am. You’ll meet the expert team at the base dome, where they’ll explain how the activity will develop. At the dome you’ll also get dressed for the occasion: you’ll be provided of a Gore-Tex drysuit, thermal suit, boots and gloves, and a life vest. After getting ready, at the lake shore the guides will provide an instructional and safety talk. 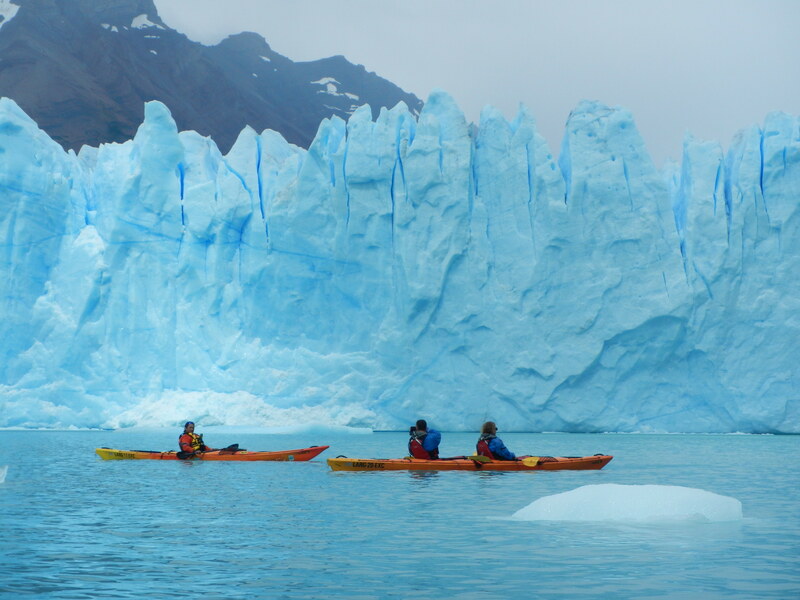 Don’t worry if you have never been on a kayak before, they’ll explain the basics to paddle on these glacial waters. 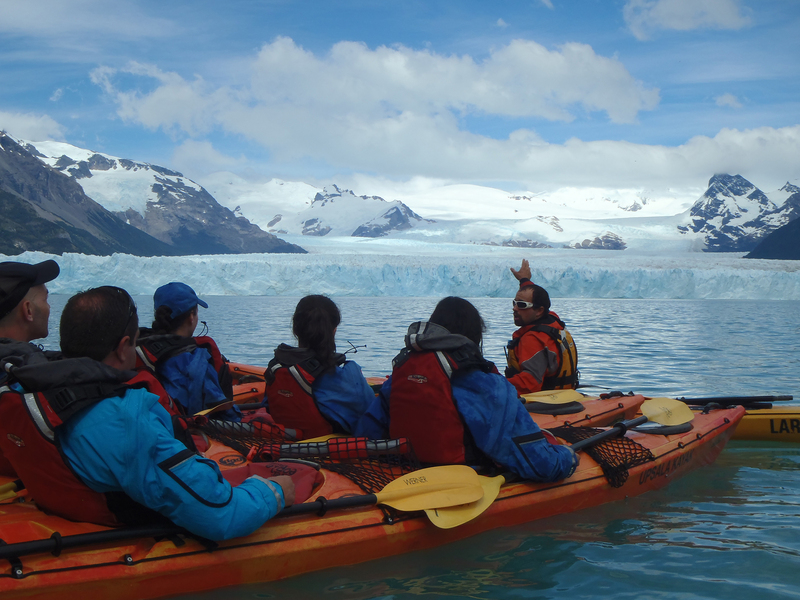 Then, you’ll board the kayak at Los Témpanos beach and paddle towards the northern face of the Perito Moreno, located just in front of us. On this quiet realm, at water level, you will appreciate the magnificence of nature at first hand, a unique perspective of this fascinating and millenary ice wall. Also, the guide that joins you will tell you more about it and the surroundings. And don’t forget about the pictures! After paddling between rests for an hour and a half, we will return to the dome for some hot beverages and snacks. But the day is not over yet! You will have time until 5 pm to enjoy a lunch box, rest and explore the National Park and contemplate once more the Perito Moreno from the walkway. 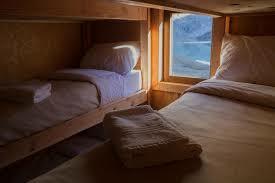 Then, you will be taken back to your hotel in El Calafate. This is a one in a lifetime, brand new experience. Never before was it possible to navigate on a kayak across these protected waters and so close to the glacier. You’ll certainly feel lucky to experience it for yourself. Full day service. Pick up from hotel starting at 8 am. Drop off at 6 pm approx. Operates everyday except on June and July. 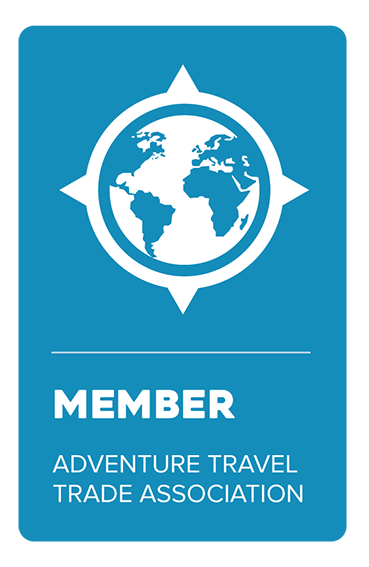 Included: Round-trip transfers from hotels in El Calafate – Kayak equipment and clothing – 1.5 hs of kayaking activity – Lunch box, beverages and snacks – An USB flash drive with pictures of the day. Not included: Entrance fee to the National Park. Min. 2 pax required to book this experience. Max. 20 pax. Min. age required: 14 years old. Children between 14 and 18 years old must be joined by their parents or guardians. No previous kayaking experience required. Activity subject to weather conditions. This experience is also available as a kayaking excursion, without transfers and lunch box. Operates at 10 am and 2 pm. Please, contact your Kallpa Executive for more information and price of this option. Join us for a kayak ride in the Argentinian Lake District, an experience to train the body and the senses. Touring the Lake District in the summer certainly is a favorite for those who visit Patagonia. 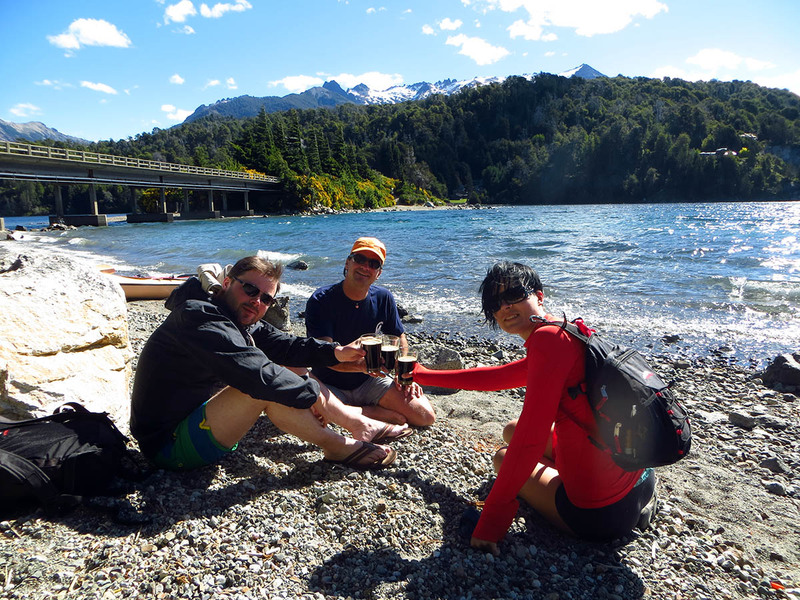 In this opportunity, we had the chance to spend an amazing kayaking day at the coasts of Lake Nahuel Huapi and we want to share that experience with you. A few hours after we started to row, we found a calm and beautiful beach, the ideal spot to stop for lunch. At that coast, we enjoyed some pies accompanied by a glass of wine and water, we relaxed under the sun and got ready for the second lap of our itinerary. As we rowed, we could delight ourselves with the astonishing views of Mounts Tronador, López, and Capilla, though the landscape is amazing all the way! After having spent a day within the immensity of this natural environment, we went driven back to our Hotel. The experience was incredible, the best thing about kayaking in this lake is that it is really easy and doesn’t require previous experience nor big physical effort. It is important though to consider the temperature and weather conditions so we can enjoy the water, which is really cold with the mellow weather. Nevertheless, the kayak can be also done in Lago Moreno or Lago Moreno Este. About this last matter, it is important to remark that the lake in which the kayak is done, will be determined at the moment of the pickup and will depend on the weather conditions and on the physical conditions of the passengers. As a final tip, if not too tired, you can end this magnificent day enjoying a cold draft artisan beer in downtown Bariloche. If you wish to obtain more information about this tour, please contact us at Kallpa Tour. The exigency level of the kayak crossing is adjusted to passenger’s experience. In the heart of chaltén, ice and rock merge into this extraordinary Patagonian experience to make you live an authentic mountain adventure. We invite those wanderlust spirits to traverse the outermost places of Chaltén, to climb rock and ice, to cross thick forests, and to spend the night at a mountain refuge. Certainly, this is a program that promises an unforgettable experience. This fresh proposal consists of a two-day experience that includes a guided trekking that starts at Estancia Los Huemules and leads to the impressive Cagliero glacier. The Trekking offers a variety of landscapes, including the possibility to walk the immense Cagliero’s ice cap. Our adventure begins early in the morning at Los Huemules visitor’s center. From this meeting spot, we start a 2-hour walk through a thick lenga’s forest crossed by a well-maintained trail up to the first lookout point: Laguna Diablo (Devil’s Lagoon). This stretch of the trail is smooth therefore it doesn’t require too much physical effort. 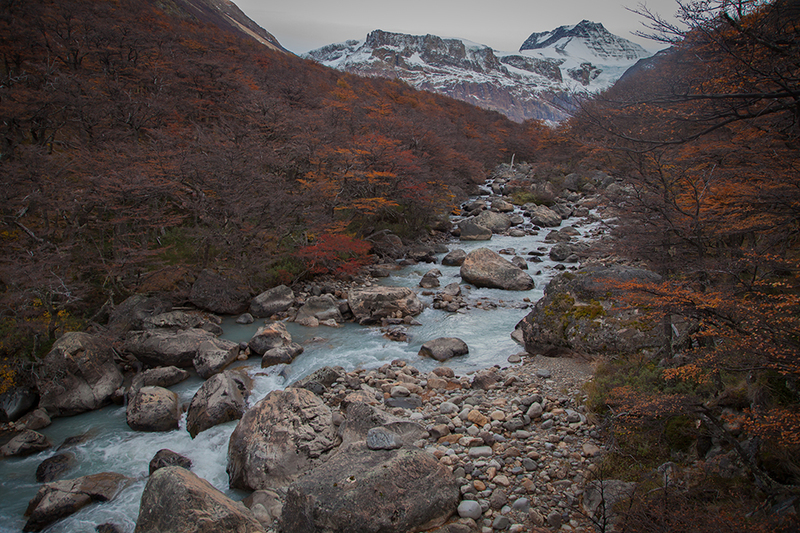 From Laguna Diablo, we can appreciate the Cagliero Refuge, where we will spend the night, and part of Valle del Diablo (Devil’s Valley), named after the lagoon. As we skirt Laguna Diablo’s northern margin and leave Estancia Los Huemules’ property to access Campo Gorra Blanca (a private property), the path gets irregular and a bit more demanding up to Via Ferrata where the second instance of this activity takes place. Vía Ferrata is a one-kilometer rock stretch with a two hundred meter slope. Nevertheless, it was adapted with iron rungs and steel cables to ensure a secure and comfortable climbing, though it demands physical effort since the rocky and icy paths are irregular. 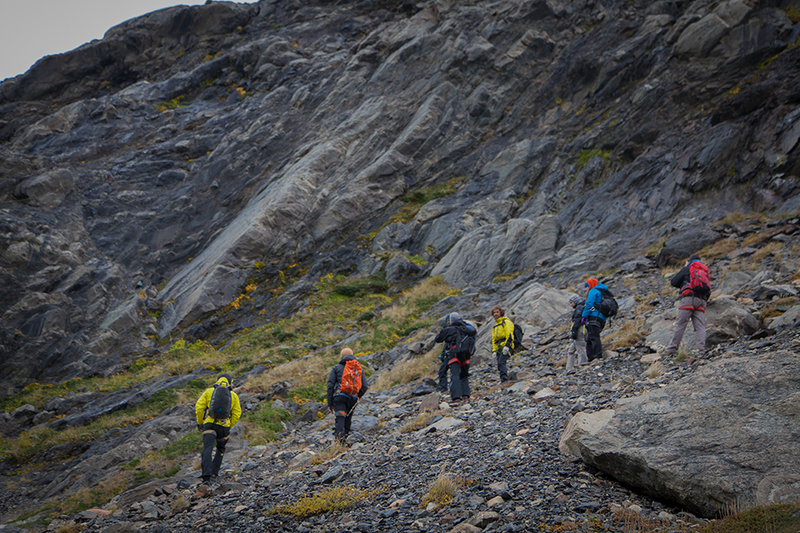 At this stage, the guides will provide us will all the necessary equipment for the climbing and instruct us on its use. After an hour climbing Vía Ferrata, we reach the second lookout point: Mirador del Glaciar, where we will be able to contemplate Cagliero’s unexplored southern side, the immensity of the valley and the walls of Treinta Aniversario and its attendant peaks, especially Diente Del Diablo (Devil’s tooth). 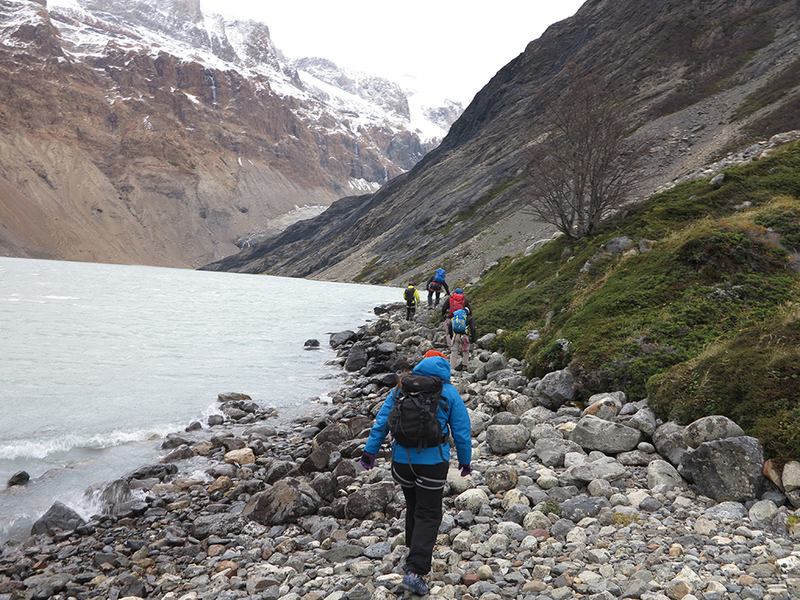 A short walk later, the third instance of our experience takes place: the trekking through the glacier itself. This stretch will last approximately two hours and, if the weather conditions are favorable, there is the possibility to have lunch at the glacier’s surface and enjoy its unique scenery. Lunch finished, we take the same path to return to Puesto Cagliero, arriving approximately at 16:00 pm. Puesto Cagliero is an authentic mountain refuge that offers the possibility to spend the night in its compact yet cozy rooms. At the refuge, we will enjoy a simple and tasty dinner that can be either pasta, homemade pizzas or a warm vegetable soup. The second day of our excursion starts with breakfast at the refuge, where the guides also provide the box lunch for the day. Then, we have free time to explore by ourselves and take one (or more) of the different self-guided paths that cross Estancia Los Huemules, perfect opportunity to get familiar with the beauty of this natural environment and its fauna. 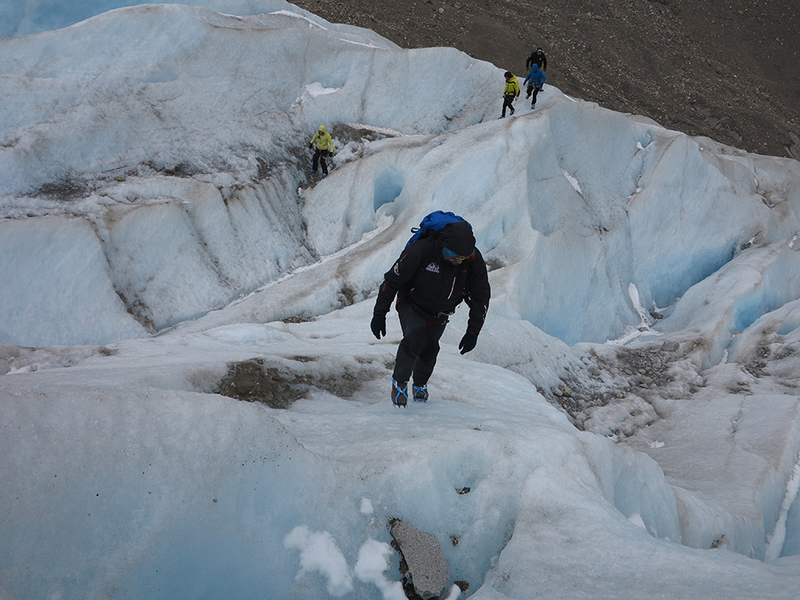 As a final observation, it is important to mention that the ice trekking requires great physical demand, therefore, it is important to check your physical conditions before signing up for this program. If Chaltén is your next destination, this is an extraordinary opportunity to make the most of this icy region and feel like a true explorer! For more information on this program, please contact us at Kallpa Tour Operator. Posada Los Juncos is a classic alpine house fully restored. Located in one of the most peaceful corners of Bariloche, surrounded by an ancient forest, facing Lake Nahuel Huapi. We offer a unique concept in accommodation in the town of San Carlos de Bariloche combining comfort with contents such as film festivals, cultural and gastronomic events, to make your stay in this part of the world, an unforgettable experience. Ideal for couples, families, friends and travelers looking for different experiences and connection with nature and culture. We have five rooms with place for twelve people. This allows us to offer a personalized service and excellence. Feel welcome to come and enjoy what makes you feel better! Rediscover your favourite place in Patagonia! A different look at Ushuaia in winter and with family.